Some people claim to have Coulrophobia, or the fear of clowns. I'm not one of them! What the hell is Sheridan even going on about chemtrails proving a round earth? That, and name-calling are the best proofs he can come up with in a 12 minute video? 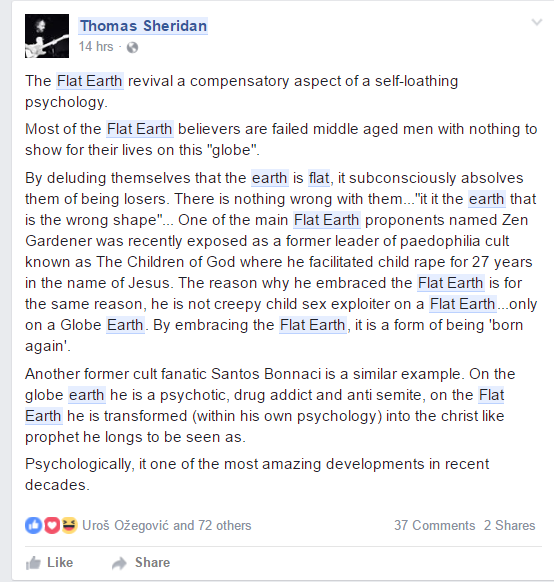 And to think I was once taken in by this charlatan..
Thomas Sheridan the self righteous zealot returns to bash FE once again! Eric and the IFERS team have exposed him for being a shill over a year ago. It's becoming obvious now that Thomas is deceiving his followers by framing us as sadistic, middle-aged, anti intellectual failures. This is the typical modus operandi of a shill (i.e., to slander genuine FE'ers and behave self righteous). The three types of shills all use this tactic albeit with varying tones. The mainstream overt shills like Neil deGrasse bash us using satire. 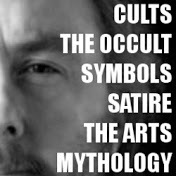 They argue against a few proofs using their guile and keep the sheeple entertained. The alternative media overt shills like Thomas Sheridan bash us with impunity and lead their slaves seemingly with an iron fist. A case of Stockholm syndrome in my opinion. The alternative media covert shills like Mark Sargent are the most slimy snakes. They are the real wolves in sheep's clothing. They overtly pretend to be one of us but plot in secret to derail our forward progress. They mix truth with conjecture to muddy the waters and make FE sound ridiculous. Using their limited hangout shows/events they create drama within the movement to keep us distracted/divided. Meanwhile, we are being portrayed to the masses as paranoid/hateful people. I'm disgusted with myself for buying 2 of this abusive, arrogant prick's books in the past Did pick them up on eBay though. Definitely an Irish shill mason and a total prick of a man to boot. watermelonman wrote: Psycho shilla. Qu'est ce? Psycho shill acts mentally unstable to scare away people from the topic. Cut themselves and use anti-Christ self proclamations and state they are the only person you should listen to. Others pretend to be paranoid and delusional to paint the tin foil hat perception on this topic. You could also lump the religious fanatics into this column in my opinion. I'm not against religion, I just think it should be put aside till after the science is done. Only when we know where and what we live on, can we then try to agree on how and who made it. Good work VP and Del. I posted earlier in this thread as watermelonman but couldn't get back into my account for some unknown reason later. Mr Sheridan is a psychopath for sure and really attacks this known truth. He reeks of freemason also. Fortunately, we have people like Del and yourself to counter this nutter.